I have always hated the idea and have been disgusted that weaknesses are built into our system of building things. 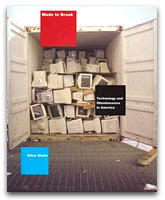 I think this will be one of the next books I read, and it's called "Made to Break: Technology and Obsolescence in America" if you couldn't tell from the title, and it's by Giles Slade over at MIT. I'll let you know how goes it when I am finished with it, that is, if the book doesn't fall apart before I'm done. Here is an audio interview on the author talking about the book.